Evidence-based design is the process of basing decisions about interior design on credible research to achieve the best possible outcome. The design technique is crucial in designing for senior living because the transition from independent living to dependent living is a critical turning point, with a high probability that it will accompany by a decline in physical and mental health due to natural aging progression. At Warner Design Associates, our senior living designs are based on research, so that our designs can play an essential role in seniors quality of life by creating an environment that encourages wellness as well as healing. What are some examples of Evidence-Based Designs? Design elements can be as simple as paint color, where evidence-based design shows a strong connection between healing and spaces that use colors that focus on nature. Research has also suggested that creating more shared places for interaction such as dining rooms, activity rooms, and fitness centers are critical in drawing residents out of their rooms to prevent isolation and depression. These are just a few examples of evidence-based design; there are hundreds of others that we’ve learned through decades in the industry. But why is evidence-based design so important? How do you like to feel when you are at home? Comfortable, relaxed, at ease, cozy, welcome? Let’s use evidence-based design to re-create that feeling for your residents. For example: strategically selecting traditional color palettes helps residents feel more at ease and relaxed. This signals to residents that they are at home and safe, which is crucial to their mental state and physical health. Another way to impact wellness and create a calm, relaxing environment is by utilizing blues, greens and nature tones. Moving from one’s own home to a senior living community can be a hard transition, but using evidence-based design to re-create the “at home experience” contributes immensely to that transition. Having gardens and views of nature is essential in healing seniors and helping with the transition process. 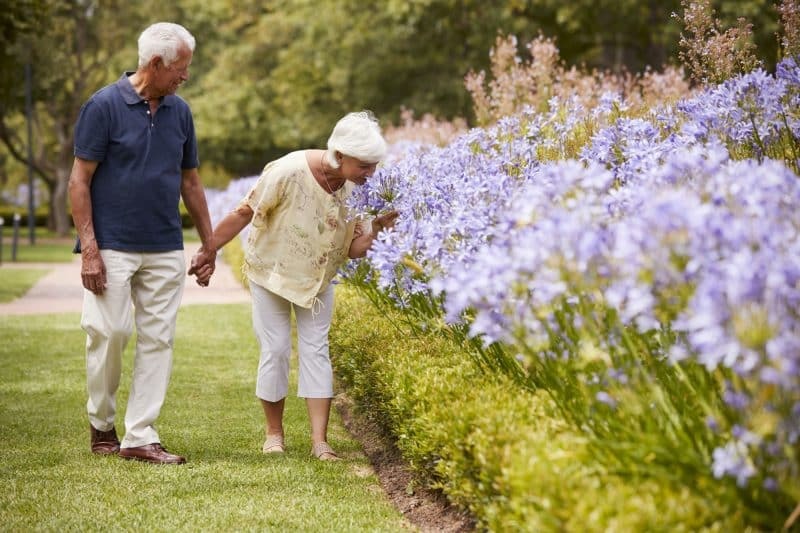 Research shows that gardens help seniors get outside and increase physical activity, as well as improve immune systems, relieve stress and anxiety, and may reduce the risk of dementia. Incorporating gardens in senior design also ensures residents are moving and communicating with each other. Having daily strolls in the garden often times reminds seniors of the joys of being outside and interacting with people. When designing for senior living, it should always start with safety as a priority. Ensuring the floors do not have a shiny tile material is essential because seniors tend to perceive waxed floors as being slick or slippery. It’s important for residents to feel safe over anything, and incorporating the proper design elements and materials is going to help give seniors the peace of mind to know they are safe. Keeping evidence-based design in mind when redesigning or remodeling will immensely impact the quality of life for seniors. Fighting boredom with designing for studies and fitness centers is crucial in keeping seniors active and healthy. When seniors are active, it keeps their spirits up and decreases the risk of depression and isolation. How are you using evidence-based design in your senior living communities? If you have any questions on interior design for senior living, don’t hesitate to reach out!